I was into my 20s when Google was launched. I was a young entrepreneur desperate to get any kind of leverage to catapult our travel start-up above the major tour operators. Google arrived at the perfect time for us. Our friends were coming out of a programming degree (Cheers H) and put us on the right track of how to get a small company immediate visibility and in front of a digitally naive world. Getting to the top of Google in those days was pretty damn easy – nobody was doing Search Engine Optimisation (SEO), and we were. Bang your address into a few directories, change your meta data, and you were outdoing the big boys. Almost 20 years on, and I have been watching very closely, Google has become an awesome and intelligent beast. Search Engine Optimisation (SEO) is constantly evolving and digital business consultants like myself have to be on our toes. To get ahead in this new SEO world is to constantly evaluate, conduct research and perform tests so you can see what works with regard to your industry and audience and then act fast before the competition copies you. It is more than just guess work, it is analysis based on case studies, and a set of invisible rules, a digital jurisprudence. I had graduated in Law, and had experience in deciphering precedents. Best SEO 2017 – Ideas, tactics, strategies, campaigns for 2017. Thanks to all our faithful clients, I, as Head of SEO at Relevance, have a large group of case studies I can test, analyse, report, and consult on, with our SEO team. We like to share, so here we can present THE most important SEO tools and strategies necessary for a winning SEO campaign in 2017. Obviously it is continually changing, but this is how we feel it stands today. Let us know your thoughts in the comment section below. In 2017, companies really need to up their content game by creating genuinely useful and entertaining content. Make sure your guidance is well-researched and actionable. The design and formatting of content are becoming just as important as the information that it contains. By adding great graphics and a more interactive design, you’ll engage people, thereby generating more backlinks and higher share numbers on social media. At Relevance we have an in-house design team which can help us with the design bits which really make the difference. Tailor your content to serve your marketing purposes. Look for articles and posts on Google that are already high-ranking and answer the same questions that they do, only make your content even better. Posts that are proving popular on social media and attracting backlinks are a good example of the direction you should go in with your content. Don’t forget to revisit old content to update it since Google loves refreshed content with new data. Some authorities say topical depth is more important than the number of backlinks accrued and Google rewards topical relevance above all. The more specific the content is, the higher is the web traffic. It’s even overtaking long-form content for organic growth as long as you keep the content relevant and publish more frequently. Keywords are still important, but be careful not to overuse them since Google doesn’t like anything it considers to be spam. Search indexing and ranking are a lot smarter than they used to be and Google uses LSI to crawl your web page to find the most common words. These words are identified as keywords, but LSI also identifies patterns in the relationships between the terms and concepts present in an unstructured collection of text. Businesses need to be more aware of this technological side of SEO and the way search engines are becoming more ‘human’ in their assessment of websites. This year, optimising for semantic language and understanding the context of keywords will be more important than optimising content for keywords themselves. Influencer marketing is still huge since it’s the easiest way to get traffic without accidentally running afoul of Google penalties. Nothing beats a word of mouth recommendation, particularly from someone with a large following who seems inherently trustworthy. Influencer marketing opens up a new channel for brands to connect with consumers more directly and more organically. In fact, personal recommendations account for 20-50% of all purchase decisions. This is also called ‘barnacle SEO’ because you’re attaching yourself to someone or something influential. Branded content created in collaboration with high authority media influencers has been proven to seduce a target audience and leverage them for your own SEO purposes. However, you should continually measure which strategies provide the most benefit to refine your strategy. Build AMP pages – 2017!!!! The usability and speed of your website are extremely important. Most websites should be mobile friendly by now and Google has repeatedly warned businesses that it will penalise your site if it isn’t mobile optimised. In fact, on-page technical SEO is more important than ever now since search engines analyse the site and page structure just as much as its content. Having a technologically-optimised site should be the foundation your website is built on, particularly for highly competitive niches. At Relevance, our technical SEO guys work hand-in-hand with website developers to make sure the website has a logical structure, keywords are planned out, and the code is fast. It’s also essential that you use a high-quality content delivery network and check your website speed with GTmetrix. Accelerated Mobile Pages (AMP) are going to be huge this year and reward AMP with a lot of SERP leverage. Encryption and security is a hot topic in 2017 since Google has recently changed the way non-https sites are handled in Chrome – Google Chrome is starting to show a security warning if you don’t have HTTPS set up. With tools like Buzzsumo, you can find authority social media accounts in your industry. If you make a connection with them by commenting on their content and complementing their brand, they’ll be more willing to share your content at a later date. Quality over quantity is the priority with this method of SEO marketing. If you target the right influencers, you can sometimes get a natural link from them when they write about your topic. The more people read your work, the higher your SERPs (Search Engine Positions) rankings will be. This is pretty difficult and very time consuming, so you can always advertise your content to get the targeted reach you need. At Relevance we use, depending really on the client industry, Twitter to get to journalists and high authority media influencers, and other social media for B2C. Backlinks are the core of the Google Algorithm. Any company/website doing well in the SERPs will have a good selection of quality relevant backlinks that send referral traffic to the website where they spend quality time on the site which they find relevant to them. Anchor text is important, try to mix it up as best you can, and keep a natural balance. I have no problem with a follow or no-follow link or just a mention – all digital PR in 2017 is good SEO in my book. Quality not Quantity though. Getting visibility for your business via SEO is a vital business objective in most cases. It is a long-term play, but can get you lots of relevant traffic, that usually has a high conversion rate. 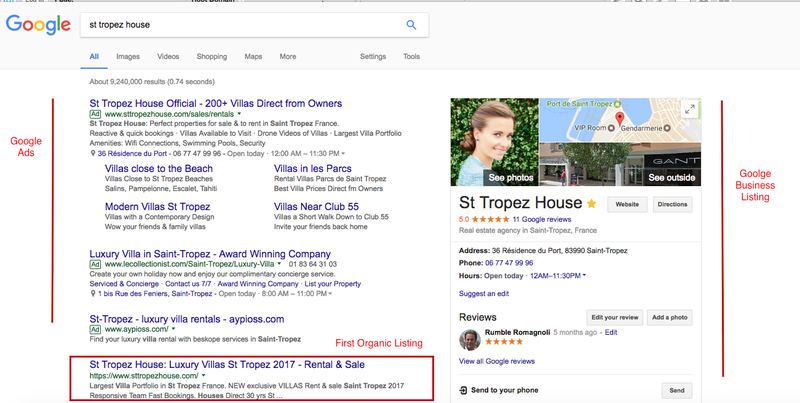 However, Google is making it harder for SEO rankings to appear above the fold (what you see on your computer/phone without scrolling) – the top 4 listings are ads, and then there is usually the Google Local Listings – then SEO results are after this. Luckily for us SEOs people do actually use Google for research – they do not just tap on the first listing and buy. However, if you want to increase sales or get any immediate traction, you will have to advertise as you work on your SEO campaign and it will be advised to make sure the two campaigns are running side-by-side. For all brand new businesses, you will definitely have to advertise, as most SEO campaigns only start taking effect after 3 months, and can even take up to 2 years to kick in for the most competitive keywords. At Relevance we find conversion rate increases if you are in strong positions for Google Ads, Local Listings and Organic Search. Sometimes an offline personal involvement in your community, whether local or industry based, can work wonders for your online reputation. Instead of blowing your budget on link building, you could support a cause close to your industry, offer free training or organise an event. The business will get plenty of good links and mentions via the local media, social media and press releases. Internal links are the perfect free way to improve your web page authority and lower your bounce rate by pulling your visitors deeper into your site. By linking to your own web pages, you get complete control over your anchor text and you can choose old pages with good authority from which to link from. This should be at the forefront of everything in SEO practice from content to technical SEO. If your visitor doesn’t have a good experience on your page they’ll bounce and won’t come and this, in turn, affects your search engine performance. The same applies to content; no matter how well-written a piece is or how great-looking an infographic is, if it doesn’t answer the visitor’s question or keep them engaged, your rankings will fall. PR has, for a while now, been the fuel of SEO. Google measures websites on the brand mentions, and backlinks (dofollow or nofollow) from authoritative and relevant media. Your SEM is going to find this pretty difficult, so help them with a PR team who specialises in getting brands into large publications. And make sure you ask for a link back. The Google Algorithm has over 200 Ranking factors; making little SEO changes will lead to changes in your positioning in the ß so you really need to have your finger on the pulse by monitoring little changes here and there. If you only have one site, it will be hard to make lots of different changes, even within 3 months, and know which changes led to improved or deteriorating visibility. However with a strong SEO site map in place you will be able to measure particular pages, and particular keywords assigned to those pages to get a better idea about how your campaign is working. There is some really great SEO software out there such as MOZ, and Searchmetrics which will really help. Google Analytics isn’t bad either 😉 If you don’t have the time to commit, you will definitely save money by hiring an SEO agency. It really depends how much time you have to commit, and I suppose the on-going know-how. Keep up with it as it changes every day. This article is jam-packed with SEO strategy ideas, but really only touches the tip of the SEO iceberg. It gives you my best practice SEO for 2017. There will of course be differences in opinion, as the Google Algorithm is a unwritten rule, so everyone might have an opinion. If you have any questions about our SEO, are interested in getting advice from Relevance SEO consultants, or would like to organise a brainstorm with myself, please feel free to get in touch through my LinkedIn.